When a valeting or car cleaning business currently produces wastewater in one way or another, it has to be contained and possibly purified or removed. Businesses with this responsibility include valeting companies, car washing or mobile car wash outlets when washing vehicles when hosing down and when collecting water during cleaning vehicles. One way to collect and purify fluid waste products is to build a permanent facility. But this often requires substantial investments and a permanent facility is not always a feasible. The Washman mobile and inflatable washpad (with inflatable edges) offers an alternative to this. The receptacle is mobile, flexible and easy to set up and remove. Taking only seconds to inflate the water tight floor can be used as an inflatable wash pad for hand washing or pressure washing cars. The wash pad is mobile, flexible and fast to set up. 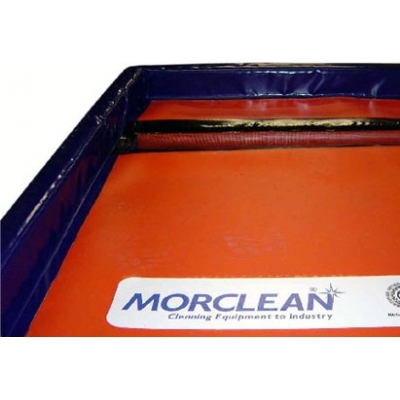 The standard inflatable wash pad weighs only 1Kg per square metre and can be easily transported. Simply roll out the mat and inflate it with the blower supplied. Drive the vehicle on to the inflated mat (while it is still inflated) and you have a fully portable wash pad. When the vehicle drives onto the floor the edges bend and then return upright. Specially made for the valeting industry commercial vehicles and cars generally fit onto a 3m wide by 5m long wash pad. Heavy goods vehicles are better using a Specialist heavy duty PVC or inflatable 4.5M wide floor and these can be specified in any practical size and dimension. The floor will not be damaged by the weight of the vehicle it is designed for. Although innovative and easy to operate the wash pad is more than just a simple construction. All wash pads are fully heat welded and have to be fully tested and we guarantee water tightness of the floor. All welded joints and connections are vacuum tested and inspected during a quality procedure. Every Washman wash pad is given a unique registration number to ensure identification of all the products used during construction.